Save cubes is a nice to play game, where your objective is to try to save all the cubes that for some unknown reason, are falling from the sky. You must drag them to the safe platform.But this won’t be so easy. 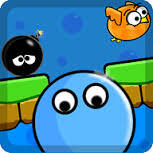 There are a lot of obstacles on the way.You must be careful and avoid them.The full version has 25 challenging levels, that will give you hours of fun.Very funny and addicting, like other games such as Cut the Rope, Angry Birds, Where is my water?, Doodle Jump, etc.We are sure your children will love Save Cubes, due to it’s amazing graphics and funny sounds.